Perfectly tuned up algorithms allowed FitPal iPhone app evaluate user fitness conditions by monitoring their fingers with the phone’s back camera. This gave iPhone ability to seamlessly coach users on their fitness workouts. Measuring fitness directly by iPhone made possible by FitPal. FitPal team successfully completed their pilot project where hundreds of iPhone users worldwide assessed their physical energy level, discovered their personal best time for exercising, and received personalized recommendations on optimal and safe exercise intensity for each workout. Now that state-of-the-art application for managing people fitness is available in App Store for iPhones only. Thousands of people use FitPal at the gym or at home, receiving lots of fitness feedback from their bodies. Many discovered that exercising at noon is better for them that at morning. Some found out that they should be exercising way harder to get some results, while others prevented the overtraining syndrome. Lots of positive feedback received from personal trainers as well. Many people go to gym or have an outdoor exercise at a certain time and follow a certain fitness plan and diet. From time to time a personal trainer brings a breath of fresh air in a boring schedule by introducing few new exercises and some tips for fitness improvement. Most of these people were surprised to see FitPal iPhone App diagnosed them with undertraining with little or no result in fitness performance. Some fitness enthusiasts often jump straight into exercising with full passion and later get the overtraining syndrome. They often forget that significant performance improvement can be made without the hard work but with the properly tuned up fitness plan. Training with wrong intensity and rest intervals makes body and heart weaker, not stronger. Continuously making such mistakes professionals finish their fitness career early with various health issues caused by overtraining. 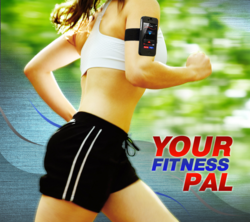 FitPal Fitness Test will help identify the cases of overtraining and suggest adjusting the workout. FitPal uses iPhone built-in camera with flashlight to capture pulse from user’s finger and calculate functional capacity and optimal level of exercise intensity for each workout. This helps to ensure the greatest possible health benefits while significantly lowering and controlling risks of overtraining. At any time users can instantly check their pulse with FitPal to make sure they are staying within the recommended heart rate zone. FitPal was created by a group of fitness trainers, medical doctors, international scientists and world-class graphic designers. The application is available on Apple’s App Store for iPhones only.